A face lift, also called a rhytidectomy can help restore a more youthful appearance by tightening the muscles of the face and neck, and removing excess skin and fat. The ideal candidate for a face lift is someone who has loose facial skin but which still has some elasticity in it, and a relatively well defined bone structure. Patients are usually in their 40s, 50s, or 60s, but face lifts can be successfully performed on patients in their 70s and 80s. Facelifts are usually performed under a general anaesthetic, although a local anaesthetic along with a sedative to make you drowsy can also be used, so that you remain awake but feel very little discomfort during the surgery. Most people return to work 10 to 14 days after the surgery. Private costs for a facelift can range from approximately £4,000 - £8,000. You may be surprised to hear that face lift operations have been performed by surgeons for more than a century. However, they really only came into fashion in the 1960s when they were carried out by highly qualified surgeons in hospitals. Prior to this, cosmetic surgery had all been rather secretive! In the early days of face lifting, additional procedures to improve the neck were done in a separate operation at a later time, but today a facelift and neck lift are usually performed at the same time. Other developments and refinements in how facelifts are carried out followed as more operations were performed. These included different incisions and stitching techniques in order to prevent women who had had face lifts looking like their skin had been stretched in a wind tunnel! Nowadays, face lift patients have a much more natural look to their faces after surgery. The classic facelift or Rhytidectomy technique changed little until the early 1970s, when a Swedish surgeon, Tord Skoog, MD, presented and published his work about such operations. Skoog argued that face lifts could be made more successful in their look, and longer lasting in their effect, if tightening the muscles of the face and neck could happen as part of a face lift, as well as merely getting rid of any excess skin. This is known as a S.M.A.S. facelift. In the late 1970s, some plastic surgeons began to use lipoplasty (liposuction) as a method of re-shaping the area beneath the chin and jaw line. They also started to use liposuction in any areas of the face which required it as part of a face lift. The S.M.A.S. facelift is still the most commonly performed technique used today, although a number of other techniques have also been developed and have their fans. It is probably safe to say that there is no obvious “best technique” on which surgeons agree! What many surgeons do agree on, however, is the ideal candidate for a facelift. This is someone who has loose facial skin but which still has some elasticity in it and a relatively well defined bone structure. Patients are usually in their 40’s, 50’s, or 60’s, but facelifts can be successfully performed on patients in their 70’s and 80’s. We have, however, noticed a recent trend towards people in their late thirties seeking a facelift procedure. According to statistics from the American Society for Aesthetic Plastic Surgery (ASAPS), 82 410 Americans had facelift surgery in 2017 to help reduce the appearance of loose skin and wrinkles around the cheeks and neck area, that's an increase of 21.9% on 2016 figures. If you're considering a facelift, the following information will give you a basic understanding of the procedure. It can't answer all your questions, since a lot depends on the individual patient and the surgeon. Please ask your surgeon about anything you don't understand. What happens during a Face Lift operation? Your first discussion with a surgeon should set out what you expect from a face lift or rhytidectomy and how you would like to look afterwards. Careful discussions regarding the reasons for wanting a facelift and your suitability for this type of surgery are very important at this stage. Make sure that you obtain as much information as is possible to help you to make a fully informed choice. It may be that a facelift is not the most suitable procedure for you, or that you may need further cosmetic help in addition to the surgery in order to achieve the results that you desire. A medical history should also be taken, to ensure that there are no reasons why you shouldn’t have this operation. You would normally be asked to read detailed information and sign a consent form at this time which means that you have understood the potential benefits and risks associated with a facelift. The surgeon may also wish to write to your G.P. giving details of the operation, so that if there are any problems associated with surgery in the short or long-term, your doctor is aware of the procedure and can help you to recover. Facelifts are usually performed under a general anaesthetic, although a local anaesthetic along with a sedative to make you drowsy can also be used, so that you remain awake but feel very little discomfort during the surgery. Please take into account that a general anaesthetic carries more potential risks than a local one. This should be clearly explained to you by the surgeon before any decisions are made. If you make a decision to go ahead with a facelift, the actual procedure may take place in an outpatient surgical clinic, or a hospital setting where you can recover overnight. The entire operation can take between 3 and 5 hours. For a facelift and a necklift, or if your surgery is going to take a long time, your surgeon may chose to perform the procedures in two separate sessions. Although there are many variations to the facelift procedure, generally a cut is made in your hairline at about the site of your temple. It then goes right round and behind your ear and finally into the hairline where it is hidden. This “frees” the skin so that the surgeon can pull it tighter and up and backwards. Once the skin has been pulled into its new position, any excess fat is trimmed off by the surgeon. In some instances, the deeper facial tissues may also need to be repositioned in order to restore a more youthful line to your face. If necessary, a small cut beneath the chin allows fat to be removed from the saggy areas under the chin with the use of liposuction. The wounds are closed with stitches and/or metal clips on the scalp. The surgeon then applies a dressing to protect the entire area where the cuts were made. Sometimes temporary drainage tubes are used to help reduce swelling. Some types of facelift can be performed without leaving visible external scars. An example of this is the endoscopic surgery performed using a tiny fibreoptic camera inserted through half-inch cuts in your mouth and temple. The scars will not be visible afterwards. The camera is connected to a television which allows the surgery to be seen on a screen. This technique is particularly useful for patients with sagging cheeks, deeper nasal furrows, (the grooves down the side of the nose), thinner lips and down-turned corners of the lips. If you want to have a rough guide to how your face might look after such surgery, you can put a finger on the corner of your lip and then lift the skin upwards and outwards. How long will it take to recover from a Face Lift? Depending on the length of the operation, you may be allowed go home after a few hours, or remain in hospital for a couple of days. Most patients return to work 10 to 14 days after the surgery. What are the risks and potential complications from Face Lift surgery? There is pain and discomfort for several days following surgery. Facial swelling is usually at its worst 24 to 48 hours after surgery, and it may take several weeks before all puffiness goes down. Most bruising will disappear within two weeks. You will also experience some numbness in the facial area, which may last for several weeks or longer. Your stitches will be removed a week or so after surgery. As with any operation, there are risks or side effects associated with a face lift or rhytidectomy, such as reactions to the anaesthetic, bleeding, haematoma, asymmetry and nerve damage. Haematomas are collections of blood under the skin and, if small, can be absorbed of their own accord over several days. Drainage may be required for larger haematomas. Injury to the nerves that control facial muscles is usually only temporary, but can result in numbness to some areas of the face. 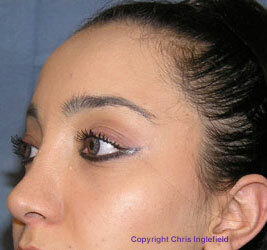 Asymmetry means that there is some difference in the result of the surgery in different parts of the face. At its worst, eyes can look lop-sided, or features do not seem to be lined up symmetrically after surgery. Such an uneven result is not common, however. Post-operative infections, although rare, can occur. Operation scars are permanent. They do fade over time and are usually hardly noticeable, as they are often hidden, either by your hair or the natural creases in your skin. Occasionally, however, scar tissue may widen and become thicker in the healing process making it more noticeable. What should you do after a Face Lift operation? It is very important that you follow the advice of your surgeon carefully after a facelift. Who should not have a Face Lift operation? Most people can have this surgery as long as they are generally in good health. It is also vital that you are realistic about what you expect from a facelift. Who can perform a Face Lift? Only fully trained and qualified surgeons should perform a Face Lift or Rhytidectomy operation. Is a Face Lift available on the NHS? It is highly unlikely that anyone considering a facelift or rhytidectomy surgery would be able to access this free of charge on the National Health Service. However would always recommend that you visit your General Practitioner before embarking upon a cosmetic procedure involving surgery. As well as their advice and guidance they may also be able to refer you to a local surgeon for a consultation. What is the average cost of a Face Lift? Prices for a private face lift operation can be in the £4,000 - £8,000 range. Fortunately, there are very few complications following a facelift or rhytidectomy operation. Every year, many thousands of people undergo successful facelift surgery, experience no major problems and are pleased with the results. Although a facelift and necklift can improve a number of problems associated with ageing in the face, they cannot, however, get rid of sagging eyebrows, or remove deep horizontal creases in the forehead. They will not remove excess skin and fatty deposits in the upper and lower eyelids, or wrinkles around the mouth. There are other treatments described in the treatment options section of this website, or a plastic surgeon can provide further information if you have an interest in other procedures to treat these areas. Following a facelift, some relaxation of facial tissues will occur during the first few weeks. After that, the ageing process continues. This is inevitable! Your bone structure, skin type, sun exposure and heredity (your genes and family characteristics) and how you live your life generally, all contribute towards how young you look after a facelift and how long the benefits will last. In general, younger patients enjoy longer-lasting results. If you are in your forties, the effects may last up to 10 years. If you are in your sixties, your results may last 5 to 7 years. Mid Face before surgery and 3 months after mid-face lift surgery. Click for ALL Face Lift clinics in the UK & Ireland registered and verified by Consulting Room.